I used to have great skin. I was the girl in high school who never had to worry about breaking out before a big date. Having nice skin made me lazy, though. I never developed a good skin care routine, and while I still don’t break out, my skin definitely has some blemishes and flaws. My nose bothers me the most of all. Blackheads–UGH! I’ve used Biore strips for years, but they are expensive, they hurt my nose, and they never get rid of all the blackheads. So when I saw this trick on Pinterest, I couldn’t wait to see how it worked! 1. Make a paste using a teaspoon of baking soda and a tiny amount of milk. I only used this scrub on my nose, but if you want to exfoliate your whole face, use a little more baking soda. The recipe I used calls for a quarter cup of milk, but it was too liquid-y and I felt like I poured most of the milk down the drain. 2. Wash your face with warm water. This will dilate your pores and make the most of the baking soda scrub. 3. Gently scrub your face/nose with the baking soda and milk paste. The baking soda neutralizes the pH of your skin and the lactic acid in the milk helps clean your pores out. To maximize the effect on your skin, let the baking soda paste stay on your skin for a minute or two before rinsing. 4. Rinse off with warm water. Then, you can also splash some cold water on your face to constrict your pores and prevent more blackheads from forming. When I first tried this scrub, I was surprised at how cold the milk was! Next time, I let the scrub sit on my counter for a few minutes, and then used it as a scrub right when I got out of the shower. 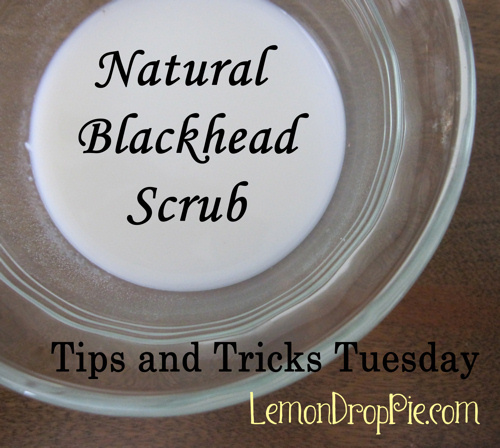 It wasn’t a miracle scrub; I still felt like I had blackheads. But it worked just as well as the Biore strips, didn’t hurt my skin (my skin actually felt great!) and I hope it will prevent blackheads. I’m going to keep using it! Do you have any skin care tips? Tell us about them in the comments! I used these websites for this post: Natural Skin Care and LiveStrong.com. Yes, water would work fine too! Thanks for sharing this. I am going to try it and I also passed the link on to my daughter and husband who have oily skin. Thanks for passing it along, Debby! I never had good skin and I still don't! I'm always on the look out for helpful tips! I might try this. I think Biore strips hurt!! I'll have to give this a shot. Sometimes I make a paste out of dried milk powder and water and use it as an exfoliating scrub. It works pretty well too though it's surprisingly strong stuff! My recent post Sexism sells. You are so lucky to have had great skin in high school! I wonder if it works for dry skin. With this obnoxious winter weather, my skin has taken a beating! I will have to give this a try.